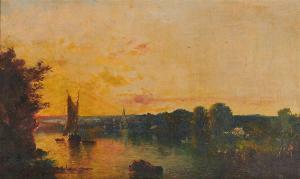 Find artworks, auction results, sale prices and pictures of George Loring Brown at auctions worldwide. 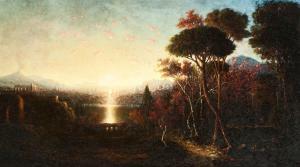 Sale 167 - Sunday, Nov 11, 2018 12:00 PM Lot 39 GEORGE LORING BROWN (American, 1814-1889) Sun Set oil on canvas inscribed verso Sun Set, Geo. L. Brown, 1862 8 3/4 x 14 3/4 in., frame: 11 1/2 x 17 in. Provenance: The Estate of Thomas W. Leavitt, Director of the Johnson Museum of Art, Cornell University. Other Notes: Cornell University Professor Thomas W. Leavitt (1930-2010) was the founder of The Herbert F. Johnson Museum of Art at Cornell University and director of the museum from 1973-1991. Prior to founding the Johnson Museum, Professor Leavitt as director of the University's A.D. White Museum of Art, and he was President of the Association of Art Museum Directors from 1977-1978. George Loring Brown (1814 - 1889) Lot 26: George Loring Brown Description: Image retains good color and clarity. There is roughness and small losses to the edge of paper, notably lower left facing and loss of pigment in base of tree trunk in foreground. Image is otherwise very good. Note: Titled on verso. 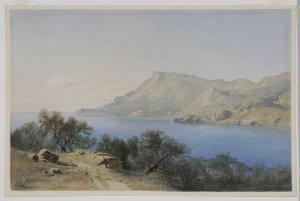 Artist studied in Paris during the years of 1832 and 1833. A somewhat similar work titled "Ancient Trees with Figures" signed and dated 1834 was sold at Bakker and Boccelli Cambridge, Massachusetts on May 3, 1998. Provenance: From the Private Collection of a well-known Fine Art collector from Southern Maine. Dates: (American, 1814 - 1833). 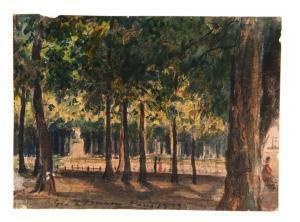 Frame: Unframed.Medium: Watercolor on Paper.Signature: Across Bottom "Geo L Brown Paris 1833".Title: "Les Jardins De Tuileries". Condition: Dimensions: 3 -1/4" x 4 -1/2". 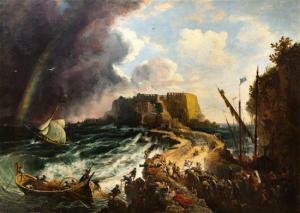 * George Loring Brown (American, 1814-1889) Castello Dell'Ovo, Bay of Naples, 1847 oil on canvas signed G. L. Brown and dated (lower center) 46 x 63 inches. Property of a Distinguished Gentleman, Grafton, Wisconsin There is craquelure throughout; this work has been lined; under UV there is evidence of scattered areas of in painting throughout, predominantly in the sky and clouds. Framed: 53 x 70 1/2 inches. SUNRISE MEMORIES OF ITALY BY GEORGE LORING BROWN (MASSACHUSETTS, 1814-1889). Oil on canvas, signed lower right. Panoramic landscape with aqueduct and Roman ruins. Restoration. 34"h. 60"w., framed, 51"h. 77"w. We provide condition information when it is requested by a potential bidder, as a part of our dedication to excellent customer service. However, the absence of a condition statement does not imply that the lot is in perfect condition or completely free from wear and tear, imperfections, repairs, restorations or the effects of aging. Garth\’s Auctions shall have no responsibility for any error or omission regarding an item's condition. We encourage you to call or email with any questions. We also encourage you to come see us and preview the auction in-person. Thank you for your business.